John Acey Goodelock who was born in Gaffney, SC on 3 September 1925 was a fine East Coast R & B singer and pianist who made a series of tasty 45s into the soul era. He first appeared on record backing Wilhelmina Gray on Seeco in 1953 but didn't make a disc under his own name until five years later. The gently swaying Why is a blues ballad of some considerable charm on which he sounds oh so relaxed, and the cooing male chorus add to the mood beautifully. 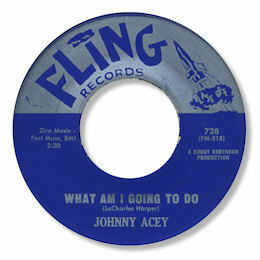 Acey's other 45 for Bobby Robinson under his own name features another strong side in What Am I Going To Do but here Johnny hollers much more forcefully, his gruff tones and lovely sense of timing really hitting home. The fierce flip "I Go Into Orbit" has deservedly had some dance floor plays. His "Johnny Chef" single "Baby Please Come Back" is a typical hard driven New York blues of the period. During his stay with Robinson he also played paino on a lot of sessions including ones for such stellar names as Elmore James and bandleader Riff Ruffin. 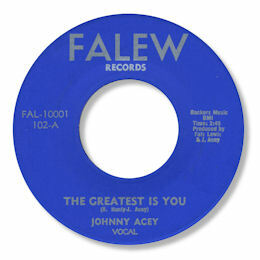 Acey cut at least 3 45s for Clarence "Fats" Lewis' New Jersey Falew label in the early 60s with the best side being You Walked Out on which his vocal is even tougher as he tells his errant woman the score. I just love these hard tough slow blues. 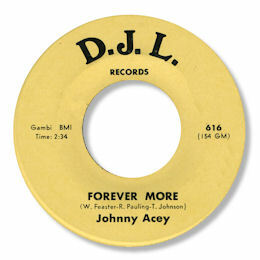 From a deep soul point of view his cut of Forever More is the pick - this is a superb demonstration of Johnny's forceful and committed vocal style over a classic horn led soul ballad. Sadly the recording is so "muddy" it is very difficult to pick out the instrumentation clearly but the side is one to cherish all right. The flip is a really strong uptempo R & B number about another wayward relationship. He went on to cut enough sides for an LP for Joe & Sylvia Robinson's All Platinum outfit in the later 60s but only a couple of 45s appeared including a slowed down recut of "My Home" done as a small band blues but packing the same lyrical punch. 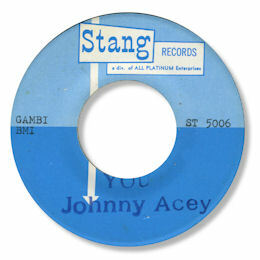 "You" is a solid soul ballad on which Johnny's tough vocal is accompanied by the famous "anaemic" All Platinum 60s strings. A real odd ball of a cut. One day I hope that all his recordings for the Robinsons will apear. The Smog City 45 seems to have been his last recording before his death on February 19 2009. Note ~ "I Go Into Orbit" can be found on almost evey compilation of Bobby Robinson's early 60s output. They also sometimes include other Fire/Fling titles. 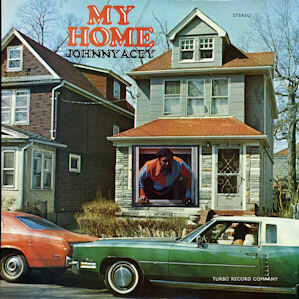 "Forever more", "My Home", "The Greatest Is You" can all be found on the Funky Delicacies CD "Rare And Unreleased New York Funk And Soul 1969 - 1979". Unusually for CDs from this source the sound quality is more than acceptable - not too sure about the title though in view of the date of recording for "The Greatest Is You".